How would you like to rent this gorgeous van that we wrapped earlier this year? We are always thankful for clients who let us help them do work for a good cause. PacWesty is one of those clients! This van was created to rent out to nature lovers and donate proceeds to the Washington National Parks! 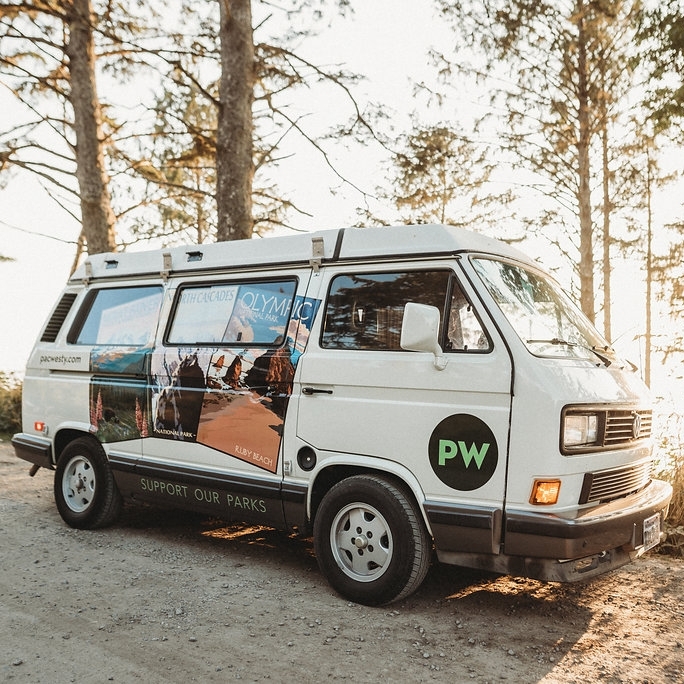 Every night that this van is rented, PacWesty donates $10 to Washington's National Park Fund to support priority park projects for Mount Rainier, North Cascades and Olympic National Parks. How awesome is that?! PacWesty is also giving you the opportunity to rent out one of their vans for 15% off! Use the code "PRISM" to rent a van anytime between now and April 30th. Thank you PacWesty for allowing us to do the van wrap for this awesome cause that you are representing! We encourage everyone to purchase this experience for themselves and a loved one for the holidays. Your holiday adventure doesn’t have to be at a resort or spa to be phenomenal! Rent one of these vans and make an adventure for yourself. Are you looking for a gift for the holidays but you have no idea what to get? Did you know that you only need to know someones’ name in order to get them a meaningful gift? We have ideas, and we can help you! Personalized gifts are much more personal than any normal material item. For example; buying her a tote bag would be nice, but if you had her name put on that tote bag, it would be much more meaningful and valuable. Objects with your name on it are less replaceable. Breaking a glass with your name etched into the side would bum you out more than breaking a normal plain glass. Are you understanding where I am coming from? If you are still at a loss for ideas, please call us! Our designers can help you out. We have unlimited possibilities. We even have gift certificates if you want to let you loved one decide what they want! ALERT: The Seattle Boat Show is coming up soon! The annual boat show is coming up next month! This means a lot of things for boat owners and people working in the boat industry. Click more to read about how you can be prepared to buy and/or sell at the show this year. We are giving you 15% off on any project that you start with us at the boat show (boat related or not). To secure this offer, you must place a deposit of $45.00 to cover the order set up fee. If you are a fellow vendor at the show in need of signage, we would love to help you sooner rather than later! While last minute signage is sometimes unavoidable, we would love for you to order your necessary signage before January 21st to avoid a rush fee! We are creating signage for brokers, yacht clubs, insurance agents, and more so it would be helpful if you were considerate of that. Thank you, and we look forward to seeing you there! At Prism Graphics, we provide a variety of services including; Vinyl Boat Graphics, Boat Wraps, Vehicle Wraps, Trade Show Displays, Indoor Vinyl Signage, Storefront Signage, Window Decals, Banners, Business Cards, Brochure Design, Custom Apparel and more! With our variety of knowledge, we are a great one stop shop for all of your design needs in Seattle.